Talk about an indecent proposal; actress Patricia Hodge's character Stella is damned if she does and damned if she doesn't. Approached rather abruptly in the eponymous heat of the Day by former Singing Detective turned Harry Potter headmaster Albus Dumbledore a.k.a. actor Michael Gambon's tactless Harrison, Stella is put in an impossible position by Gambon's stalker. Stating his wish to come and go from her flat as he pleases, he tries to blackmail the widow into becoming his mistress by informing her that he has information that her lover (Michael York) is selling secrets to the opposition during World War II and he'll expose his treason if a) she doesn't sleep with him and b) if instead she reports his stupefying war crime to the authorities herself. Based on the novel by Elizabeth Bowen which was adapted for this 1989 television production by the late Nobel Laureate, Harold Pinter, The Heat of the Day feels like a startlingly intense game of sexual blackmail on both sides as we begin questioning not just Gambon's Harrison but the leads portrayed by Hodge and York as well, should the traitorous accusations be true or false. Direct and devious like a rousing night at the theatre, the work that originally aired in the United States as part of PBS' Masterpiece Theater lineup makes for an intriguing start to a rather surprisingly offbeat trio of World War II titles from Acorn Media that abandon traditional battlefield fare for unusual points-of-view that ensure Wartime Britain is well-worth your time and investment as distinctly British in scope but unorthodox in approach. While the opening disc's heroine Stella was a no-nonsense woman of the world, the heroine of the incredibly moving, poignant and delicate effort Housewife 49 is anything but. Having suffered a breakdown a year before the made for television title begins in Lancashire 1939, which no doubt isn't helped at all by her condescending, bossy husband and the fact that her beloved son is heading off to war, Nella Last (Victoria Wood) starts up a diary as part of the mass observation war project for citizens to document their lives as impacted by Hitler's recent declaration of war on their country. While at first she's belittled by her husband for her decision to waste time scribbling away nonsense (as he believes it to be), soon as habitual writers understand well, the act of diary keeping serves as a kind of therapy for Nella to process the joys and woes of her existence. And eventually it goes so far as to give her the self-confidence to go out into the world and volunteer for the war effort alongside other women. Initially intimidated by some of the demands of the group and the domineering women involved who treat bandage preparation as either an excuse for gossiping like a sewing circle or scolding fellow workers like their own children, soon Nella comes to ascertain that she's built her all important second family of like-minded housewife friends. Proof that no two stories are alike and a valuable reminder for individuals never to rely on snap judgments since we have absolutely no idea what our fellow human beings could be going through at any given moment, Housewife, 49 was not only based on true accounts of Nella Last but also adapted by the woman playing her in the form of actress and screenwriter Victoria Wood. Obviously benefiting from a woman's touch, additionally as the title implies, it's sure to be of particular interest to mothers, sisters, wives and daughters wanting to know more about life during wartime than the mostly male dominated programming we're offered on a routine basis. Also available on its own as a multiple disc set, the sweeping miniseries Island at War closes out this excellent selection by Acorn as-- similar to their 2009 release of the vintage series Enemy at the Door, we receive a more modern and thorough examination of citizens who bravely endured German occupation on the tiny channel islands during the second world war. Although countless citizens fled and some simply packed up their children to send them to London safety as orphans, others either too weak or too strong in body or spirit decided they weren't going to relinquish their homes and way of life by courageously deciding to stay the course. While in this case the island is fictitious, having seen the reality steeped Enemy at the Door, I can assure you that the situations are all to real in what I personally feel is a superior venture than the '70s more episodic series that introduced too many subplots which were dropped as soon as the episode's final credits ran. Due to the sheer length of the miniseries which is spread across three DVDs and its wise decision to focus on a select few families as well as a distinct group of German soldiers so that it's much easier to become invested in them emotionally and keep them straight, Island at War is a triumphant look at a part of the British war I was completely unfamiliar with until witnessing it in Door. Filled with espionage, adventure, danger, romance and hidden secrets as citizens must rely on intuition and existentialism in deciding what they can or cannot abide by during occupation, the miniseries which co-stars Life on Mars actor Phillip Glenister as a German officer is easily the standout title in this above average, solid compilation, bolstered by Acorn's wise choice in ensuring that none of the plots or characters overlap too much. 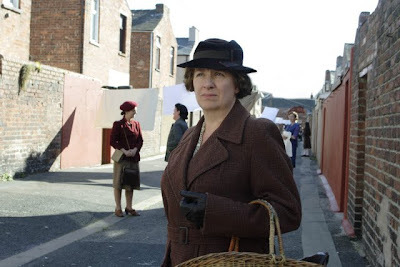 While fascinating as well for male viewers who are sure to get caught up in Island, Wartime Britain is also a great idea for a Mother's Day set for a history buff due to its more than usual emphasis on female point-of-view. And considering the fact that it has no shortage of strong, brave female characters, Wartime makes a perfect companion to the recent release Wish Me Luck which showcased housewives and factory girls who put their bravery to bold use by crossing enemy lines to become British spies. A first rate selection of award-winning highbrow features that also marks the debut of Gambon's turn as an indecent proposer in Heat of Day, Wartime Britain's five-disc set offers you roughly six hundred minutes of stellar drama.